We had a full house for Thanksgiving. Bill and his family, David and girlfriend Ashley, and our other son, Javid, all came to help us eat turkey and tons of other goodies. What a pleasant day that was. We are truly thankful for all our blessings, especially including a wonderful family. 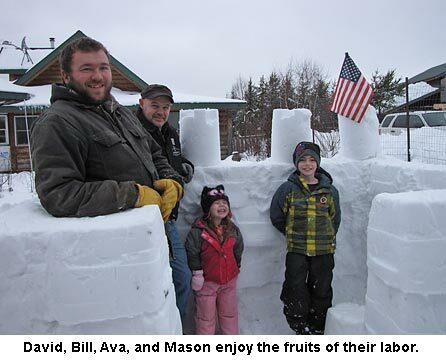 After dinner, Mason and Ava asked Uncle David to come out and help them make a snow fort because the snow was perfect for packing, and there was plenty of it. So creative David grabbed a plastic tote and headed for the side yard where there was plenty of undisturbed snow. He took the scoop shovel and tossed two shovels full of snow into the tote then Ava bounced up and down on it with her sitter-downer. Then David carried the tote to the fort area-to-be and carefully dumped it. Mason got to work and packed snow between the blocks. 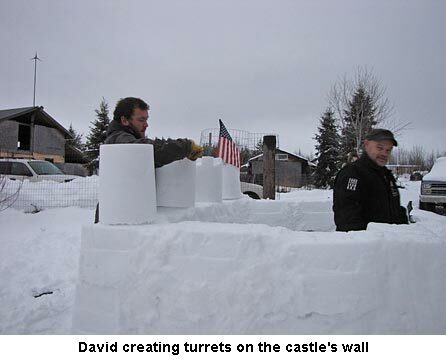 It wasn’t long until they had a great fort built, including turrets made by packing snow into a five gallon bucket. Ava dubbed the wire next to the garden gate as the jail so when someone got snowballed, they had to go to “jail.” What a fun afternoon! Heck, it was 38 degrees. ABOVE zero! It really didn’t feel cold at all. Having fun helps, too. YES! Kids still slide down pasture hillsides. And they love it. 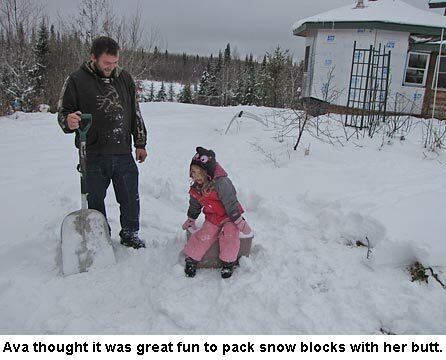 But that day we just had to use that packing snow to its full advantage. Precious memories for the children. Grandma’s house is the best. Uncle David is the best. Wow I’m impressed ! 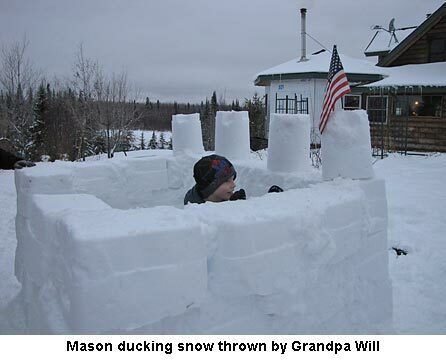 Anyone who can stay out in the cold that long to build a fort and then begin a battle of snowballs, they are strong stock. Looks like you guys had a fabulous day. How wonderful it is to have family to make these memories with. God bless you and yours .